Any movie with the word Rome in the title catches my attention. I love to relive days spent in that wondrous city by watching it come alive on film. Imagine my disappointment while watching When In Rome to realise that all the scenes that took place in the Italian capital were shot on Hollywood sets. It doesn't take a very sophisticated eye to figure that out, either. 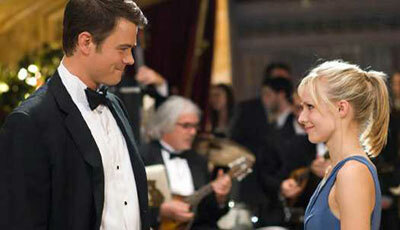 Kristen Bell as Beth and Josh Duhamel as Nick simply don't have that crackling chemistry that we long to see on screen. Why would a filmmaker, namely director Mark Steven Johnson, choose to fake it, rather than to film in Rome itself? Money, that's why: the cost of flying a cast of many notable actors to Italy, and putting them all up and feeding them the whole time. And who knows how much Italian bureaucracy is involved in setting up a film shoot there? I'm no expert on the subject, nor can I blame a director for not wanting to spend a fortune - I support that - but I was disappointed. The outdoor shots of Rome, which mostly took place in front of one particular fountain, just don't look real. Though maybe I'm being picky, this is not the only thing about the film that seems like a half-hearted effort. The leads, Kristen Bell as Beth and Josh Duhamel as Nick, simply don't have that crackling chemistry that we long to see on screen. However, the rather far-fetched story manages to entertain because of the efforts of fine comic performers Danny DeVito, Will Arnett, Jon Heder and Dax Shepard. Their wacky characters each fall crazily in love with New Yorker Beth because each once threw a coin in the Roman fountain of love, and she accidentally plucks those same coins out in a moment of romantic cynicism - thus activating an ancient Italian love spell.